At Barnton Community Nursery and Primary School, we view History as a way of encouraging pupils to become detectives who explore the past in a variety of exciting ways. History allows children to investigate a wide range of sources from which the past may come alive and inspire the children to want to find out more about times gone by. History allows our children to compare and contrast, to examine how and why things have changed, to learn about historical figures and expand their research skills. 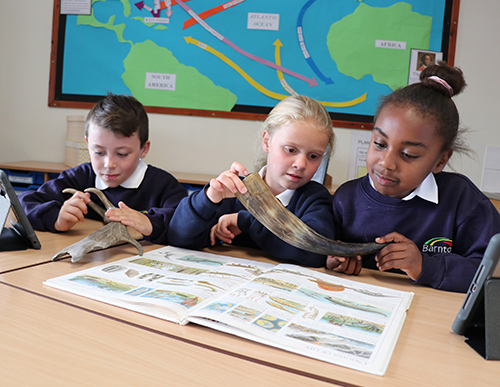 At Barnton Community Primary School, we aim to inspire children’s curiosity to know more about the past. We teach children to be open minded and enquiring thinkers who gain a coherent knowledge and understanding of Britain’s past and that of the wider world. We want them to understand how people have lived in the past and compare this to life in modern times. We encourage first hand experiences through handling real artefacts and historical documents, wherever possible we arrange fieldwork visits to relevant sites of historical interest within the local area.